With each new match in Apex Legends, the map of King’s Canyon is filled to the brim with an enormous amount of loot each match, whether they’re lying on the ground, on top of a roof, or hidden in a Supply Bin or Loot Tick. Key to survival in Apex, as with any battle royale, is to get your hands on the best loot as quickly as possible each match – so to that end, our Apex Legends loot guide will walk you through where to go to find all the best loot, from the Hot Zone to the periodically spawning Supply Ships and Supply Drops. We’ll also show you our map of all Supply Bin locations along with explanations of the various Loot Ticks hidden throughout King’s Canyon. If you’re looking for more info on Apex Legends as a whole, you won’t find better than our Apex Legends tips/guide, which is packed with beginner-friendly info and advanced tips and tricks. You can also find links to all our other Apex Legends guides, from Apex Legends characters to Apex Legends guns/weapons and much more besides. When it comes to deciding where to go to find the best loot in Apex Legends, there are a lot of different elements to take into account. We’ll go through each of them one by one, from Supply Bin locations to Loot Ticks, Supply Ships, and much more. If you’re looking for more information on specific locations, then you’d best check out our Apex Legends map and locations page, where we talk about the individual named locations across King’s Canyon and the quality of loot you can expect to find there. There are two main ways to find loot in Apex Legends. First is floor loot – that’s the stuff you find just lying on the floor, generally inside a building or around a point of interest. The other method is by opening Supply Bins – big white and red containers that always appear in the same places each match, and which each contain three pieces of loot, from weapons and attachments to healing items and gear. Take a look at the map below for a non-exhaustive list of Supply Bin locations. Bear in mind that this is an incomplete map posted on Reddit by user “haydra007”, because we know some bins, at least, that aren’t mentioned here (the small cluster of buildings just below Market, for one). But for now, this is the best the playerbase has to offer. Click on the image above to view it at full resolution. You can open Supply Bins by walking up to them and pressing your Interact key. Bear in mind that you can’t close them again, so an opened Supply Bin will forever stay as an indicator to others that someone has been here already. It’s also worth noting that opening a Supply Bin can instantly kill you if you are standing atop the Supply Bin at the time, and there’s nowhere for you to be shunted out of its way. That’s full elimination, by the way. Not knocked, but instant death. So be careful of that. At the start of each match, a different location will have a blue circle over it. This is called the Hot Zone. Any loot found inside the Hot Zone has a chance to be highly valuable, and they are your best chance of finding the extremely rare “fully-kitted” guns – gold versions of non-Legendary weapons which come fully equipped with top-tier attachments. Notice I say “best chance” instead of “only chance”, because it has been pointed out that there is a chance for these “fully-kitted” gold weapons to appear outside of the Hot Zone, which will no doubt come as a surprise to many (it certainly did to me). Thanks to RPS commenter “Ragnarok7005” for the below screenshot submitted as evidence. Let us know in the comments if you’ve been lucky enough to find a “fully-kitted” gun outside the Hot Zone! Finding such a powerful gun early on can be extremely beneficial to your survival chances, and as a result a great many teams will often choose to land wherever this circle appears – hence the name “Hot Zone”. Risk, meet reward. You might or might not have already known about this, but hidden across the map each match are these little robots, each of which looks like a tetrahedron on legs, which incidentally are also Apex Legends’ version of loot crates which you crack open out of game. In-game, these so-called Loot Ticks barely move at all, and are usually hidden in hard-to-reach areas that require vaulting and wall-climbing to approach. The good news is you can punch (or shoot) a Loot Tick to break it open, causing it to drop some high-tier loot. Each Loot Tick is colour-coded based on the loot inside, much like a player’s death loot. So if you find a gold Loot Tick, you’ll find at least one gold item inside. 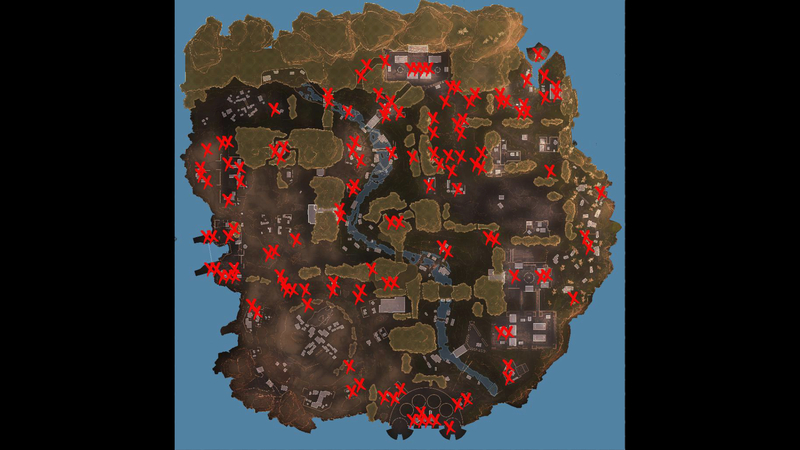 Like the Supply Bins, the possible locations of these Loot Ticks are the same each match, but unlike the Supply Bins, not all possible Loot Tick locations will actually hold a Loot Tick each match. If you’ve ever played Fortnite, it’s like the treasure chests you find scattered across the map. To aid you in discovering these loot-filled robots, each one will give off a sort of cutesy WALL-E-esque robot audio cue to indicate that one is nearby. Follow these noises and you shall find the Loot Tick. They’re usually found on rooftops or atop tall furniture in buildings, hidden away in the corner where they’re easy to miss. But it’s pretty much always worth it to break one open and see what’s inside. Another unique feature of Apex Legends’ map is the supply ships – enormous flying ships much like the cargo ship that drops you all off at the start of the match. These ships will sporadically appear at different locations throughout the match and contain valuable loot both on the main deck and below, which is why they are often very popular places to go at any stage of a match. There will always be a supply ship at the beginning of a match which will slowly move towards its destination, and it’s possible to deploy and land right on top of this ship and loot up from there before dropping down. Subsequent supply ships that appear later on in a match will deploy ziplines once they reach their destination, tethering themselves to the terrain and allowing players up from the ground. Again, explore these supply ships with caution because they are popular and dangerous areas. A more familiar feature for those who have played other popular battle royales such as Fortnite and PUBG, supply drops are pods which rocket down towards the ground at various stages of a match. You’ll be notified ahead of time when and where a supply drop will land, and each one will contain three pieces of high-quality loot – and possibly one of the two Legendary weapons in Apex Legends – the Mastiff shotgun and the Kraber .50-CAL sniper rifle. These supply drops are the only places you can receive such weapons, but they’re pretty much guaranteed to give you excellent loot, which makes them yet another extremely popular and dangerous hot zone wherever they drop. As a side-note – supply drops look very much like the care packages that Lifeline can call down with her ultimate ability (for more info check out our Apex Legends characters guide); but you can tell them apart by looking at the colour of the drop. If they have a red accent, they’re a normal supply drop. If they have a blue accent, they’re from a Lifeline! That’s more or less everything we’ve got on looting and finding the best loot in Apex Legends. Hopefully now you have a greater idea of where to go throughout the course of a match. Anywho, I’ll see you on the battlefield! I’ll be the one with the fully-kitted gold Prowler.